I.SO Italia produces tanning lamps since 1980 in 4 different product lines: facial, beds and vertical tanning units, and the easy tan module. The never ending searching for quality, design and efficiency, allow I.SO Italia to be known and regarded as one of the most important solarium producer company in Italy and worldwide. Quality and an advanced technology are essential requirements to be able to ensure to tanning centres equipments that use an easy, reliable and innovative tanning lamp. ISO Italia tanning lamps are made complying with all the european security regulations to guarantee the experience of a safe and efficient tanning. The company also gives spare tanning lamps to anyone who've bought tanning units, giving buyers the chance of benefit from discunts on lamps that can reach 50% off the price. 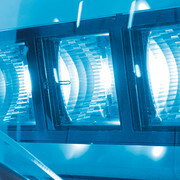 I.SO Italia tanning lamps are distribuited on a wide distributors marketing net in italy and worldwide. To have more information about I.SO Italia tanning lamps, do not hesitate to contact us.